How many players can play Battleborn locally (couch co-op)? Is a subscription service (i.e., PS+, Xbox Gold) required for the second local player? How is player progress saved? How many players can play Battleborn via system link or LAN? 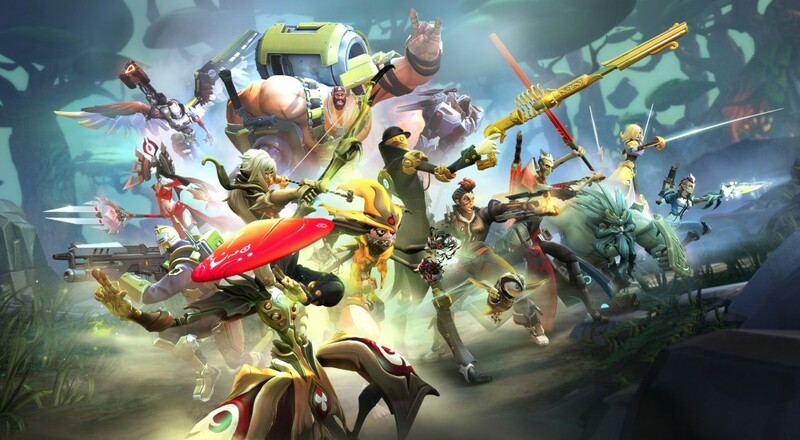 How many players can play Battleborn online? What direction is the screen split in couch co-op for Battleborn? Does the PC version of Battleborn support split screen play? What do the co-op Story Missions entail? Are they just MOBA style matches against A.I. bots? How do you begin a co-op session in Battleborn? How does save game progress work for co-op play in Battleborn? Can I join a game if the host is further along than me in Battleborn? Can more than one player choose the same character? How are gear/item drops handled? Is it free-for-all or instanced? Temporary power-ups, gear, credits, shards... what is all that stuff? You just said a bunch of words, what do they actually do? 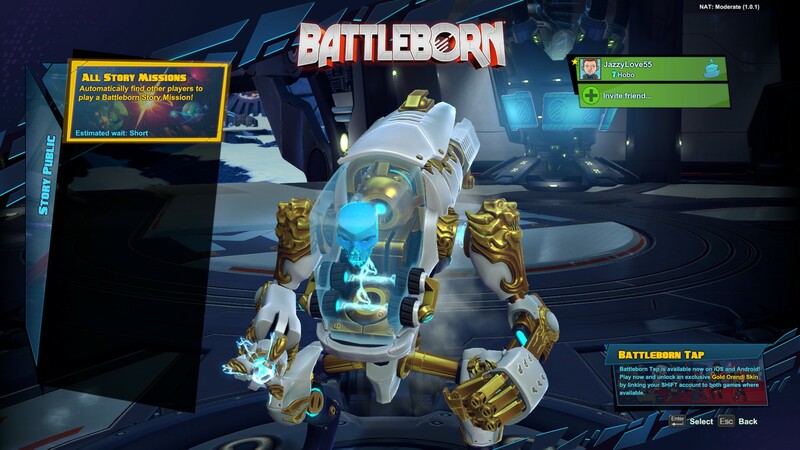 What does the Battleborn season pass get you? How are new characters unlocked? Two players can play split screen on PS4 and Xbox One. PC local co-op is not supported. On the PlayStation 4, both players must have a PS+ account in order to play the game. This is a requirement regardless of whether you want to play online with others or not. If only one player has a PS+ account, then he/she is the only that can play. The other player will get an error if they try to join. On the Xbox One, only one person needs to have an Xbox Gold subscription due to the sharing feature. Progression is saved individually per player. Any experience, gear, and credits you acquire when you play (whether online or locally) is saved to your account. Command Ranks, acquired gear and credits, character unlocks, and Character Ranks are saved per platform, meaning if you play the game on the PC and then start playing on the PlayStation 4, none of that will carry over. 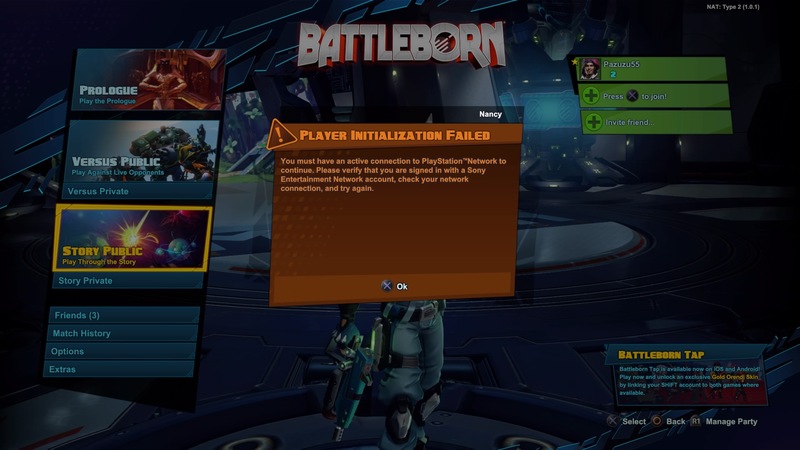 LAN and System Link is not supported for Battleborn. Up to 5 players can play the co-op missions online together. 5 players can play together by combining local and online means. The split screen is a horizontal split. Story Missions are objective-based encounters that usually take anywhere from 30 minutes to an hour to complete (similar to Strikes in Destiny). You may have to fight your way through a series of enemies and bosses, or defend specific targets against foes. They are distinctly different from the PvP matches. There are two types of way to play co-op in Battleborn: Private and Public sessions. For Private matches, players must either join or be invited to the lobby by a party leader. From there the leader can choose any of the missions he or she has unlocked. For Public sessions, players can queue for either a Random Mission or the last mission of the base game (mission 8), if they have it unlocked. In Public matches, the game will find other players until the full complement of 5 players is filled out. If a Random Mission was queued for, players vote between 3 random missions or can select "No Preference." The most popular mission will then be played. In the campaign, missions are unlocked in sequential order and must be completed in order to unlock the next one. If you join another player's game and he/she selects a mission that another you haven't unlocked yet, you will still be able to play the mission and earn whatever rewards you acquire from playing (i.e., medals, character unlocks, XP, and gear). The missions themselves aren't really tied together in any significant way from a story perspective, so if you complete mission 6 before mission 2, you don't need to be concerned about spoilers. If you do play and beat a mission you haven't unlocked yet, it still counts as completing that mission for the purposes of unlocking the next one. For example, let's say you've only completed up to Story Mission 3 on your own, and then join another player's game and complete Story Mission 5. 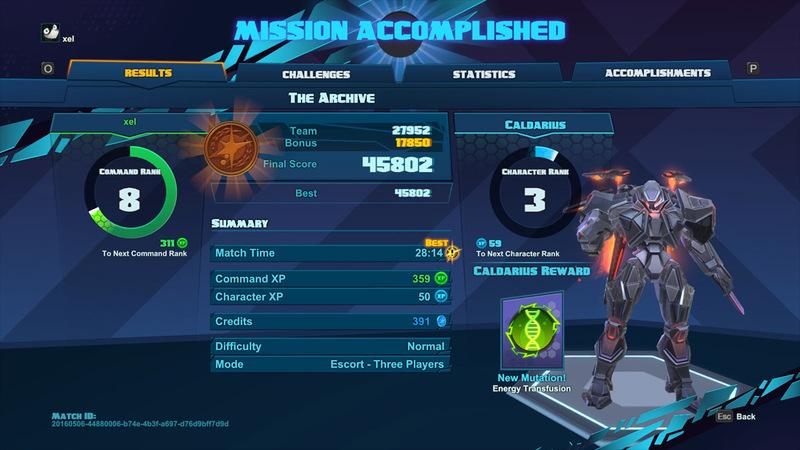 When you complete Story Mission 4, either on your own or with a group, then you'll see Story Mission 6 automatically unlocks as it counts your previous victory in Story Mission 5. It's a bit confusing, but the bottom line is that unless you're hosting a Private match with friends, you don't need to worry too much about playing through the missions in numerical order. Yes, you can join any mission either in a Public or Private match regardless of whether you have the same mission unlocked. 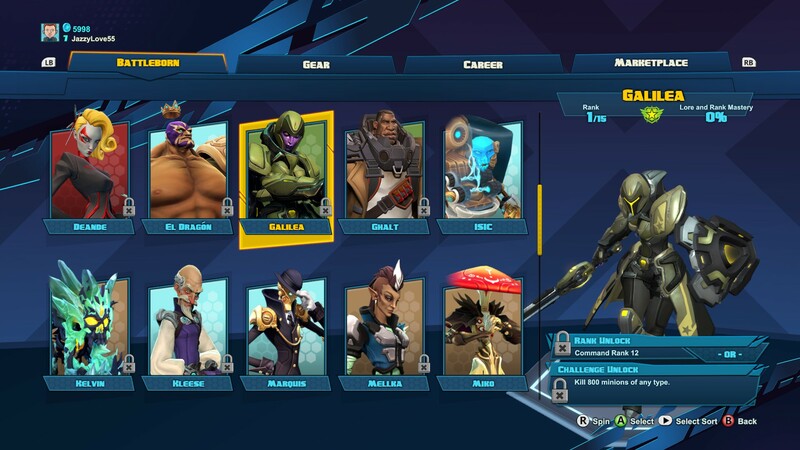 In Story Missions, players can choose the same Battleborn character, though the host in a Private match does have the option to force players to choose different ones. PvP matches require players to choose different characters. Scattered throughout the Story Missions are boxes and containers that may contain temporary power-ups, credits, shards, experience orbs, point orbs, gear, extra lives, health, or helix orbs. Of those, the gear, shards, experience, credits, helix orbs, points, and extra lives are all shared across the team, so it doesn't matter who picks it up, the whole team benefits. The temporary power-ups are the only items that are not shared. Yeah, there's a lot of stuff happening all at once. Here's a quick breakdown of all the items and what they do. Gear - this the "loot" of the game and provide your character with boosts (such as increased health regen, more attack speed/damage, or increased reload time). From the Command screen, you can create a "Loadout" that includes three pieces of gear. Gear ranges in quality from common to legendary, with higher quality gear usually providing better benefits. Any Gear acquired by a player during a Story Mission is shared across all players (though the specific Gear you get is unique to each player). Gear is activated during a match using shards. Shards - these are usually found in special containers and big crystals. Shards are used to activate gear, build turrets/friendly bots, and open certain objective-based doors. Each player has their own stash of Shards during a Story Mission, but picking up a Shard also gives one to the rest of your team. Credits - these are used to buy Gear packs from the Marketplace, increase how much Gear you can hold, and increase your total number of Loadouts. Unwanted Gear can be sold for more Credits. Any credits that are picked up during a mission are shared across all players (i.e., you pick up one credit, your teammate also gets a credit). Experience Orbs - these are used to level up your character within the Story Mission. Some portion of this also contributes to that particular character's Character Rank, which unlocks new skins and helix mutations, and your Command Rank. Experience is shared across all players. Helix Orbs - these provide an instant level for your character within the Story Mission. All players benefit from these. Extra Lives - during a Story Mission, you have a limited number of respawns. Players can revive one another, but if they don't make it within the 30 second limit, then you have to respawn. Picking up Extra Life orbs will increase the total number of respawns you have during a mission. Point Orbs - point orbs add to your total points at the end of a mission. This determines the medal you get (bronze, silver, or gold), which are tied to specific character unlocks, and also seems to play into the experience you earn for your Character Rank and Command Rank. Temporary Power-Ups - there are three of these: speed boost, overshield, and cooldown reduction. These are not shared across the team and the only character that benefits from the power-ups is the character that picks it up. The Battleborn Season Pass comes with 5 pieces of DLC. Each DLC pack comes with a new story mission, one hero key to instantly unlock a new hero, and unlockable skins and taunts. The new heroes will be free to all players, regardless of whether they own the DLC, but they will have to be earned through challenges. Characters are unlocked one of two ways: reach a certain Command Rank, or complete a certain challenge (e.g., complete five matches as a "Rogue" character). From the "Command" screen, you can view the requirements you must meet in order to unlock a particular character.